One of the key opportunities that StartingBlock has is showing off technology and innovative ideas of Madison-area entrepreneurs and innovators. Trust us, we are already working on showcase posts about the StartingBlock companies. But as we’ve been working to build this very special space, we’ve consciously looked for and found some remarkable people who are excited to to make StartingBlock special and unique. The Findorff construction team built four phone booths for StartingBlock, but we knew we needed more. We wanted to try a solution that was flexible and would allow us to move the booths to almost anywhere at StartingBlock as our space and community evolves. The cubicall solution was less expensive than new construction (in an existing building) and most other furniture options out there. They were also fast. Most furniture dealers require a 8-12 week lead time. 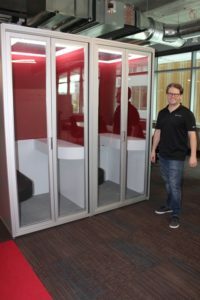 The cubicall booths shipped out in less than two weeks, which is even more amazing since our cubicall booths are customized and built specifically for StartingBlock. I first called the cubicall team back in January about what StartingBlock was looking for. As entrepreneurs, Anthony and Michael immediately grocked the StartingBlock project. In fact, they built their first booth in 2016 because their marketing company worked out of weworks where phone rooms were full and calls in their open office was distracting and disruptive. So they started looking into buying a module phone booth. The only one that was out there at the time was framery (a U.K. company that makes beautiful modern phone booths for around $15k). They also looked at upcycling old phone booths, but discovered the booths were too big to fit through interior doors. So Anthony—a DIYer can-do type of guy—decided that he could build one himself with the mission that they could take it with them when they moved locations. Once built, they started getting compliments from their clients. Compliments that turned into requests and requests that turned into sales. In short order, they pivoted right out of their original marketing company and started cubicall in August 2017. Within a month, they sold three booths, site unseen by the buyers. Today, cubicalls are in four Fortune 100 companies and two Fortune 500 companies with most customers being tech companies in California, New York and Boston. StartingBlock is the very first cubicall in the entire Midwest! Having installed cubicalls in some really cool spaces for other well-heeled tech clients, we were excited to bring cubicall to StartingBlock. We were even more thrilled to see Anthony and Michael’s reception of our new space. They had great things to say about the StartingBlock space and concept. Michael said that he knew StartingBlock was going to be cool and different, but “not this cool.” They repeatedly expressed their wish that LA had a StartingBlock and that we are one of the best locations that they’ve installed a cubicall. In fact, they liked StartingBlock so much that they asked if we’d let other potential clients see the booths at StartingBlock. They also gave us a discount offer that we can pass on to anyone in Madison who wants to buy a booth, which is cool. 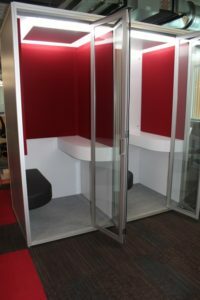 Unlike most other places with cubicall booths, we wanted to put the booth smack in the middle of our Open Innovation Space on our 3rd floor. Give a startup advice and they find a solution because by the time I placed the order, cubicall had a new product that where two booths are installed as an island with a customizable backside perfect for branded space at trade shows and other temporary spaces. 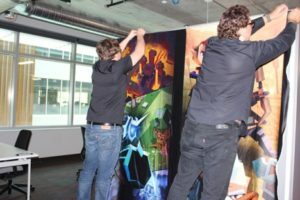 They also gave us a great deal so that we could customize the entire back of the booth with some cool PerBlue graphics. We thought this a great initial concept since the Wisconsin Games Alliance will be stationed within throwing distance of the cubicall booths. (Watch for some cool announcements re a limited edition booth with some BIG NAMES and cool COMICS.) The StartingBlock booths were made possible by the generosity of MGE and we are excited about getting local artwork up on the back panel in the future. In the meantime, it’s nice to have a little bit of our neighbor, PerBlue, represented at StartingBlock. It took a couple of hours to set up the two side-by-side booths at StartingBlock. Now that they are installed, we can move them on a dolly without needing to completely break them down, which is the kind of flexibility we aim for at StartingBlock. We hope that the StartingBlock community loves and uses the cubicall booths—with light, white noise, fan, power, desk and seat, USB charging, and acoustic panels—as much as we hope. And if you find ways to improve them even further, I am sure that the cubicall team would love to hear your feedback.